ors possible; almost every color other than red is produced using argon, mercury and phosphor. The colors in order of discovery were blue (mer- cury), white (Co2), gold (helium) and red (neon), followed by different pastel colors from phosphor-coated tubes. 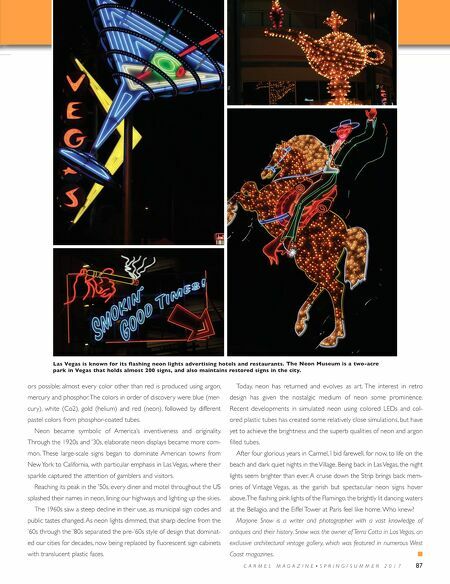 Neon became symbolic of America's inventiveness and originality. 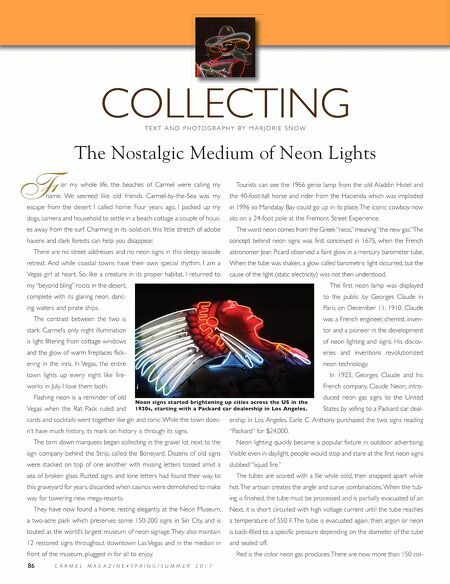 Through the 1920s and '30s, elaborate neon displays became more com- mon. These large-scale signs began to dominate American towns from New York to California, with particular emphasis in Las Vegas, where their sparkle captured the attention of gamblers and visitors. Reaching its peak in the '50s, every diner and motel throughout the US splashed their names in neon, lining our highways and lighting up the skies. The 1960s saw a steep decline in their use, as municipal sign codes and public tastes changed. As neon lights dimmed, that sharp decline from the '60s through the '80s separated the pre-'60s style of design that dominat- ed our cities for decades, now being replaced by fluorescent sign cabinets with translucent plastic faces. Today, neon has returned and evolves as ar t. The interest in retro design has given the nostalgic medium of neon some prominence. Recent developments in simulated neon using colored LEDs and col- ored plastic tubes has created some relatively close simulations, but have yet to achieve the brightness and the superb qualities of neon and argon filled tubes. After four glorious years in Carmel, I bid farewell, for now, to life on the beach and dark quiet nights in the Village. Being back in Las Vegas, the night lights seem brighter than ever. A cruise down the Strip brings back mem- ories of Vintage Vegas, as the garish but spectacular neon signs hover above. The flashing pink lights of the Flamingo, the brightly lit dancing waters at the Bellagio, and the Eiffel Tower at Paris feel like home. Who knew? Marjorie Snow is a writer and photographer with a vast knowledge of antiques and their history. Snow was the owner of Terra Cotta in Las Vegas, an exclusive architectural vintage gallery, which was featured in numerous West Coast magazines. C A R M E L M A G A Z I N E • S P R I N G / S U M M E R 2 0 1 7 87 Las Vegas is known for its flashing neon lights advertising hotels and restaurants. The Neon Museum is a two-acre park in Vegas that holds almost 200 signs, and also maintains restored signs in the city.